In the pantheon of fantasy writers, no diety is treated with greater reverence than J.R.R. Tolkien, who is regarded by most readers as the Father of Modern Fantasy. During the past three decades, the fantasy area in bookstores has expanded from a minor subsection of science fiction to a major category in its own right. A couple dozen titles have been replaced by hundreds. Fantasy has gone from being a cult genre to entering the mainstream. This would not have happened without the popularity and influence of Tolkien's The Hobbit and The Lord of the Rings. Nearly every published fantasy author acknowledges having read and been inspired by Tolkien's canon, and, while The Lord of the Rings may not be the longest or most complex fantasy series to date, it remains the standard against which all similar works are measured. It is the epic fantasy series. When Tolkien began writing The Hobbit in the 1930s, he was unaware that he was essentially defining a genre. Tolkien was not the first author to write what would eventually be labeled as "fantasy", but his synthesis of elements - mythology, stories of larger-than-life heroism, the supernatural, and fairy tales - was unique. Nothing on the scale or scope of The Hobbit and The Lord of the Rings had previously been seen - not even the legends of King Arthur, Merlin, and Camelot were as well developed or executed. The Hobbit, the prequel to The Lord of the Rings, was first published in 1937. The first two volumes of The Lord of the Rings, The Fellowship of the Ring and The Two Towers, were released in 1954. The final book, The Return of the King, reached British bookstores in 1955. It was another ten years before Ballantine Books published the four novels in the United States - and that's when the series' popularity took off. By the time of his death in 1973, Tolkien, although not a household name, was certainly well-known. In 1978, Rankin-Bass, taking advantage of the growing Tolkien-mania, produced a poorly-animated TV version of The Hobbit, featuring the voices of John Huston and Orson Bean. Later that year, Ralph Bakshi's ill-fated cinematic animated adaptation of the first half of The Lord of the Rings trilogy bombed at the box office, killing Bakshi's hopes of making a second film. In 1980, Rankin-Bass entered the breach left by Baski's incomplete work, making The Return of the King in the same style as The Hobbit, and once again featuring Huston and Bean. So, with the exception of the second half of The Two Towers, all of Tolkien's four-book saga has been brought to the screen in one form or another. Yet, the story gaps, inconsistencies, and poor quality of animation have always rankled Tolkien fans. To say that fantasy movies have not been a big draw at the box office is to understate the matter. A lot of this has had to do with the poor quality of the product. Consider the evidence: titles like Willow, Dragonheart, and Dungeons and Dragons. Finally, 2001 has seen the belated emergence of fantasy as a legitimate cinematic genre. Harry Potter and the Sorcerer's Stone was one of the year's most anticipated releases and, by the end of December, it will be one of the top money-makers of the past 12 months. Now, along comes The Lord of the Rings, as anticipated for 30-50 year olds and Harry Potter was for their children. As entertaining as Harry Potter may be, it cannot hold a candle to The Lord of the Rings: The Fellowship of the Ring. With this production, Jackson has used The Lord of the Rings to re-invent fantasy for the cinema in the same way that the novel provided the blueprint for the written word. This astounding movie accomplishes what no other fantasy film has been able to do: transport viewers to an entirely different reality, immerse them in it, and maroon them there for nearly three hours. The Lord of the Rings: The Fellowship of the Ring brings Middle Earth to glorious life. From the first moment of the first reel, I was there. The Fellowship of the Ring begins in the quiet countryside of the Shire, where Bilbo Baggins of Bag End (Ian Holm), a hobbit, is celebrating his 111th birthday. In attendance, among other people, are Bilbo's young heir, Frodo (Elijah Wood), and the wizard Gandalf (Ian McKellan). Gandalf informs Bilbo that the time has come for him to leave Bag End and go on a journey. To Frodo, he leaves his home and his most beloved possession, a magical ring that turns the wearer invisible. But this isn't just any magical ring - it is the One Ring, forged by the Dark Lord, Sauron, and capable of corrupting the wearer. Sauron's servants, the Ring Wraiths, are scouring Middle Earth for it, since, when it is returned to their master, nothing will be able to stop him. All of the world is about to be plunged into war, and the only way to stop the evil will be to destroy the ring by casting it into the fire where it was forged - in Mordor, on the Dark Lord's doorstep. That unenviable task falls to Frodo, the ring bearer. Lord of the Rings devotees will be delighted to learn that the motion picture adaptation is as faithful as one could imagine possible (and, consequently, is nearly three hours in length). Jackson and his co-screenwriters (Fran Walsh & Philippa Boyens) do an excellent job condensing more than five hundred pages of text into a script that never feels choppy, uneven, or rushed. The Fellowship of the Ring moves fluidly and, in the process, exhilarates. Certain scenes have been cut or condensed in the name of pacing, and the role of one character (Arwen) has been expanded to enhance a romantic angle, something that was largely absent from Tolkien's work. First and foremost, The Lord of the Rings is an adventure, and, in that, it is relentlessly successful. One does not need to have read the books to appreciate the movie. The background is explained concisely in a voiceover prologue, and the action proceeds in a straightforward manner. As long as one enjoys a well-crafted adventure yarn set against the backdrop of a mythical clash between good and evil, The Lord of the Rings will satisfy. Like all great movies of this sort, this one is characterized by tremendous action scenes punctuated by moments of rest and reflection. So, we have the flight from the Shire, followed by the council at Rivendell, followed by the hazardous trek through Moria (the movie's high point), followed by the encounter with Galadriel, followed by the sundering of the fellowship. Along the way, there is triumph, sorrow, and a little philosophical depth. The Lord of the Rings emphasizes two themes: the importance of brotherhood and the need for true strength to come from within. In crafting his vision of Middle Earth, Jackson has employed all of the tricks available to him: miniatures, deceptive camera angles, location shooting, impressive set design, and matte paintings. He has also made use of computer graphics, but not to the extent that another director might have. Thus, The Lord of the Rings has a less artificial appearance than might have been the case if Jackson had relied too heavily on CGI technology. Andrew Lesnie's camerawork has the grand scope expected in an epic motion picture, and Howard Shore's score, which is at times heroic and at times thoughtful, compliments the visuals without ever calling attention to itself. The Lord of the Rings is not an actors' movie, but each member of the cast acquits himself or herself well. Of special note are Ian McKellan, who presents Gandalf as a vulnerable and sympathetic figure; Ian Holm, whose Bilbo Baggins is a weary and tortured individual; and Elijah Wood, who shows the gradual changes in Frodo as he is transformed from a carefree hobbit to the person upon whom the fate of the world rests. Some recognizable names fill small roles - Liv Tyler is surprisingly good as Arwen; Cate Blanchett is cool and regal as Galadriel; and Christopher Lee brings his chilling presence to the part of the treacherous, traitorous Sauruman. The strength of Jackson's vision as depicted in The Fellowship of the Ring gives movie-goers cause to hope that we may be in the midst of a cinematic achievement. 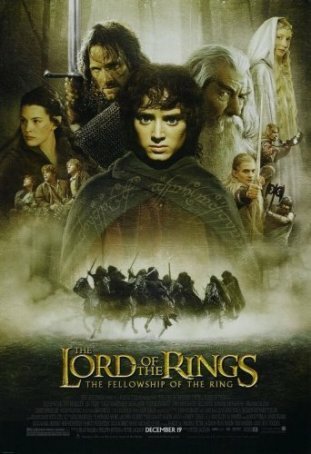 If The Two Towers and The Return of the King live up to the standard set by this film, The Lord of the Rings will become a milestone not only for its genre, but for motion pictures in general. But, regardless of what the future brings, the single movie we now have before us stands out as one of the most rousing examples of entertainment to reach multiplexes in a long time. At last, someone has figured out how to do an epic fantasy justice on the big screen.